Hallo! Heute gibt es ein Layout, das ich für Scrapbook Forever und die aktuelle Challenge von CSI- color stories inspiration gemacht habe. 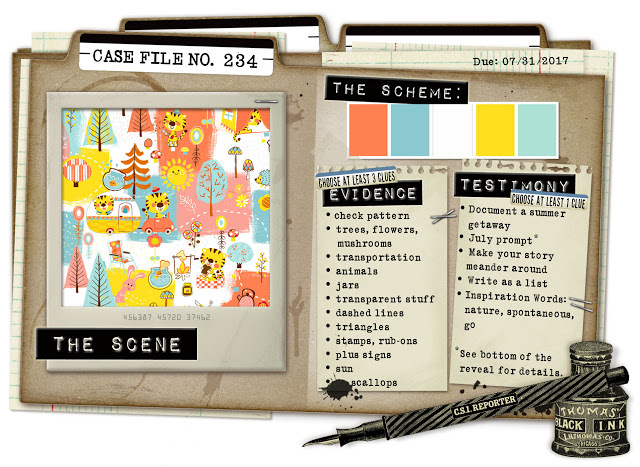 Today, I share a Layout, that I created for Scrapbook Forever and for the actual challenge of CSI - color stories inspiration. I really need these challenges to get my ideas! And this assignment this month really challenges me, cause orange and yellow are not my favourite colors ;-) But I like how it turns out! 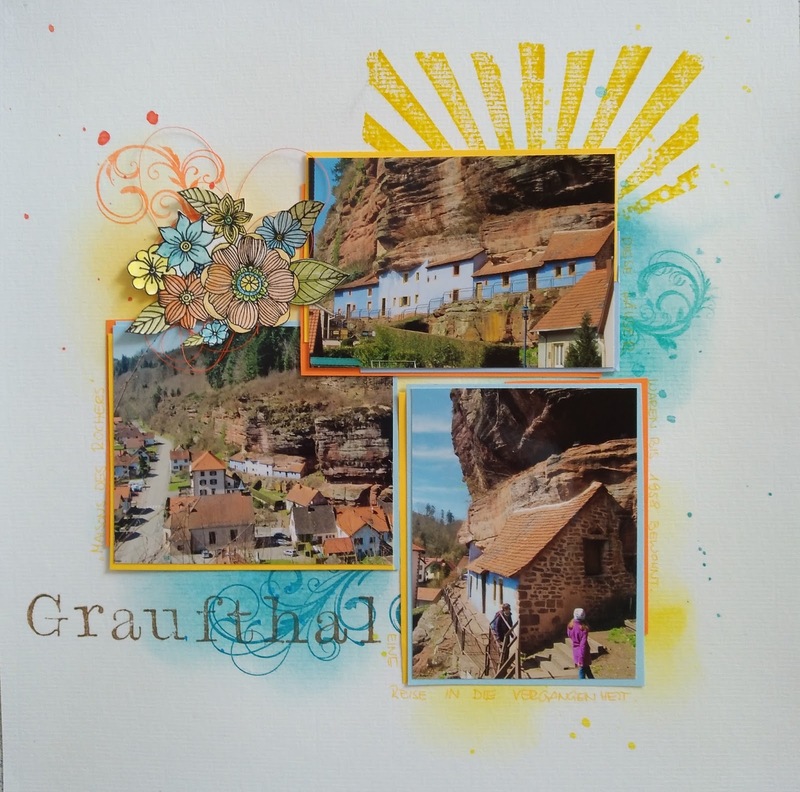 Auf den weißen Cardstock habe ich mit den Distress inks und einem blending Tool orange, gelbe und blaue Flecken gewischt. Die Klekse in der passenden Farbe habe ich mit Wasserfarbe und Twinklings H2O gespritzt. Als Dekoration habe ich verschiedene Stempel verwendet (sie Sonne ist von Tim Holtz, die Schnörkel sind SF-Stamps, das Blumenbouquet auch - ich habe es mit Distress crayons coloriert und dann ausgeschnitten). I issued distress inks in orange, yellow, blue and turquoise with a blending tool onto my white background. Than I splatted some similar colors with watercolor and twinklings H2O. The stamps I used for my decoration are from Tim Holtz and SF-Stamps (swirls and flowers). This looks like a place I would love to visit! Wow your photos are great, this looks like a great place. I love how you have used the challenge for your bright and fun layout. Thanks for joining us at CSI. What beautiful photos! Love the sunburst that adds such joy to your layout! I love your background work with the distress crayons and twinklings. Your photos match it perfectly! Great job, so glad you joined us at CSI. I really love the photos!! The ray of sun behind them looks perfect. Thanks for playing along at CSI.